Update: This article was update post-market open to account for early decline. In this past weekend’s missive “Market’s Cling To Support,” I noted the early February correction process where we saw a similar short-term bottoming process where the initial bounce failed then bounced in mid-March before failing again to retest the February lows. On Monday, the market broke through the 200-dma which puts portfolio management on high alert. However, we have seen these breaks before where the market rallies back above support by Friday’s close. With the market deeply oversold, as we saw in February of this year, we want to give the market just a bit of room here. This morning, futures are pointing to about a 1% loss on the S&P 500 at the open. Importantly, if the market fails to recover by Friday’s close we will be looking to reduce portfolio risk across the board as the risk of a deeper correction has risen markedly. The chart below shows the current break of the bullish trend from the 2016 lows. You will notice the one-day rally failed at the trendline which has now turned that previous level of support into resistance. This is a very early indication of a possible change in trend from bullish to bearish. I have mapped out corrections back to previous support levels. A correction back to this year’s lows would entail an 11.8% decline. A correction back to the 2016 lows would rack up a 38.2% decline from the market highs. Such declines, or larger, are normally consistent with recessionary drags in the economy and the market tends to be a leading indicator. Let me clarify something before I go further. In the media, and on Wall Street, there is an overwhelming push to classify views as either bullish or bearish. This is a VERY dangerous thing for investors. The reason I say this is since, in the words of Bob Farrell, “bull markets are more fun than bear markets,” investors tend to seek out “bullish” commentary to support their “hopes” of a continually rising bull market. The danger, as I have addressed in the past, is that individuals become “willfully blinded” to data that does not conform to their personal biases. This bias of seeking out only “confirming data,” known as “confirmation bias”, leads to decision making that is ultimately prone to error. While I am often tagged as a “bear” because I point out the inherent risks in investing, I assure you I am NOT a bear. I am also NOT a bull. I simply look at the relevant data and make determinations of risk based on historical precedents and statistical data. Okay, back to being bearish for a moment. The “weekly” chart of the S&P 500 below shows the bullish trends which were clearly defined during their advances in the late 1990’s, 2003-2007 and 2009-present. Each of these bullish advances, despite ongoing bullish calls to the contrary, ended rather badly with extremely similar circumstances: technical breakdowns, weakening economics, and deteriorating earnings. As I have shown in the chart above, when the markets broke the bullish trends (blue dashed lines), the subsequent bear market occurred rather rapidly. The conversion from the bull market to the bear market was marked by a breakdown in prices and the issuance of a very long-term “sell signal” as noted in the bottom of the chart. We can look at this same analysis a little differently and see much of the same evidence. The important difference between a “bull market” and a “bear market” is on which side of the long-term moving average it is trading. During bull markets, the price tends to trade above the long-term moving average AND 2-standard deviations above that average. During bear markets, the opposite is true. You can see this below. When markets break their long-term bullish trend supports, combined with important long-term sell signals and a sharp decline in momentum, it has historically denoted the start of a more “bearish market trend.” The vertical red dashed lines denotes the start of the bear market. The next chart stretches the time frame out to monthly which shows previous extreme overbought conditions and subsequent turning points. We warned in January about the market pushing 3-standard deviations of the long-term monthly moving average when combined with extremely overbought conditions. The market is currently the process of reversing those conditions. With the long-term MACD at the highest level on record, a correction that triggers a “sell signal” only has three precedents since 1998. It is important to note that I am not suggesting “selling everything and buying guns and ammo.” Furthermore, for clarity, I HAVE NEVER suggested being in “all cash.” From a portfolio management standpoint, going from “all equity” to “all cash” and back again have never been a good idea. Trying to “time the market” is impossible to successfully replicate over multiple market cycles. However, as I regularly write, it is our job to reduce portfolio risk to manageable levels to preserve capital over time. We can do that by increasing and reducing our exposure to equity-related risk by paying attention to the price trends of the market. Currently, all of the longer-term technical trends are suggesting that the time has come to reduce equity risk to more manageable levels. While more important “sell signals,” which denote a change from the bullish to bearish trend, have not been registered yet, if the market doesn’t begin to improve, those signals will be triggered. With the markets oversold from recent selling, it is more likely than not we will get a bounce which will provide a better opportunity to reduce risk into. However, that bounce could only be back to where we were last week given the weakness in the market. The chart below lays out absolute stop loss levels and sell points to take some actions. While it is possible the markets could rally back to previous resistance at the January highs, we are looking for the current oversold conditions to be alleviated. Regardless of where the markets are trading, the time to begin reducing risk is when the short-term overbought conditions return. The chart above has two important points. The “absolute stop loss” should be honored and risk reduced regardless of oversold conditions. As stated above, crashes generally happen markets are oversold. Use rallies back to previous support levels, to reduce risk. The first level of resistance is just below 2800 which are the previous rally peaks in March and June. 2) Sell those positions that aren’t working. If they don’t rally with the market during a bounce, they are going to decline more when the market sells off again. 3) Move trailing stop losses up to new levels. 4) Review your portfolio allocation relative to your risk tolerance. If you are aggressively weighted in equities at this point of the market cycle, you may want to try and recall how you felt during 2008. Raise cash levels and increase fixed income accordingly to reduce relative market exposure. This entire outlook could literally change overnight. Currently there is little indication the Federal Reserve is going to leap into action with a rate cut, another liquidity program, or even just stopping hiking the Fed Funds rate. Confidence and earnings aren’t likely going to improve from current levels, and the economic data is just about as good as it can get. In other words, the risk of disappointment greatly outweighs the potential for upside surprises at this juncture and the market may already be telling you such is the case. But, even if the market does reverse back into a more bullish trend we will miss a little of initial upside, but portfolios can be quickly realigned to participate with a much higher reward to risk ratio than what currently exists. 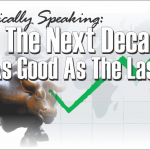 Technically Speaking: Can You “Feel” The Complacency?